Who doesn't love a pretty sugar cookie? They lend themselves to artistic expression for any and all occasions! There are so many recipes out there- I am sure that you have your favorite. Maybe it was passed down through the generations in your family. Or, you could be like one of my daughters and use a sugar cookie mix from a box. It doesn't matter where they come from, the outcome can be the same - some quality family fun decorating cookies for whatever season or occasion. 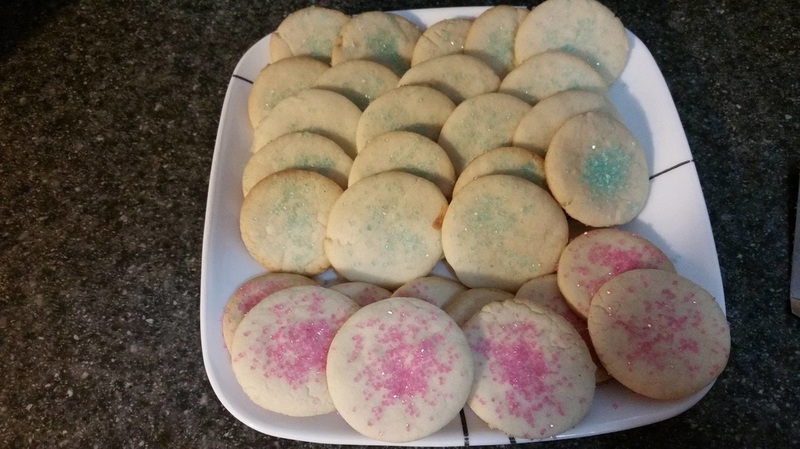 Today, I made a small batch of sugar cookies, cut in circles and decorated with pink and blue decorating sugars because they were the only colours I had. I am going to call them Scooby Snacks and serve them to our three year old grandson Noah who loves him some Scooby-Doo!! Bake some sugar cookies today and celebrate National Sugar Cookie Day with your family!! Here is the recipe I used today. It makes about 2 dozen cookies. Thoroughly cream together the shortening, sugar and vanilla. Add egg and beat until light and fluffy. Stir in milk. Blend in flour, baking powder and salt. Divide dough into two equal balls and chill for 1 hour. On a lightly floured surface, roll out one ball of dough to about 1/8 inch thick. Cut into desired shapes. Decorate with sugars, mini m&m's, etc. Or leave plain to decorate with frosting after they are cooled. Bake on a greased cookie sheet at 375 degrees for 6 to 8 minutes. Cool slightly on pan and then remove to wire rack to cool completely.